At Club Tabby in Lake Charles, La., tween girls can be a princess for a day … and shop to their heart’s content. Co-owner Natalie Comeaux, who keeps an eye out for over-the-top, fun and whimsical items with lots of color, told TDmonthly Magazine what little princesses (and their parents) are buying up. Ty Girlz™ Amazing Abby by TY INC. 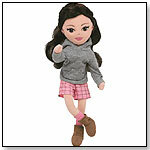 Approximately 14”, this soft doll is cozy in a sweatshirt, boots and stylish shorts. She’s part of the Ty Girlz collection and comes with a code to an online world. — Ty Girlz were popular items at My Club Tabby in Lake Charles, La., in spring 2010, Owner Natalie Comeaux told TDmonthly. 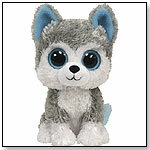 The Webkinz Peace Puppy comes with a code allowing him to join his friends in the online Webkinz World. This velvety soft pet is about 10” and is covered with peace signs. Launch date: March 2010. — Webkinz continued to be popular items with tween girls into 2010, and My Club Tabby in Lake Charles, La., was no exception. The Peace Puppy was a best seller at My Club Tabby in spring 2010, Owner Natalie Comeaux told TDmonthly. Beanie Boos - Slush by TY INC.
Toysmith’s Paint a pot craft garden comes with everything a kid needs to grow a mini flower garden. Children can paint their own design on the pot, plant the seeds, and watch them grow. The set includes marigold seed mix, organic soil, six acrylic paints, two paintbrushes, a terra cotta planter, planting instructions, and a booklet with ideas for decorating. — At My Club Tabby in Lake Charles, La., Owner Natalie Comeaux reported in March 2010 that spring items such as the Paint a Pot Craft Garden had been selling well for over a month since everyone was anticipating warmer weather. This kit comes in various colors and includes a pair of jersey knit garden gloves, a trowel, a rake, a shovel and a metal watering can. — Spring items were very popular in March 2010 at My Club Tabby in Lake Charles, La. Owner Natalie Comeaux reported that the kids watering can kit had been selling well for over a month. 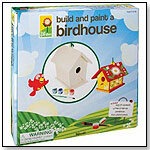 Young bird watchers can get in on the fun with this kit for building and painting a birdhouse. 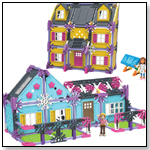 No hardware is required, and the kit includes everything needed to create and paint a 5.5” x 7” x 7” birdhouse. — With the eagerly anticipated arrival of spring around the corner, birdhouse kids were popular items at My Club Tabby in Lake Charles, La., in March 2010. Owner Natalie Comeaux reported that they had been selling well for over a month. Mesh walls allow for close-up viewing of butterflies and insects. A sliding plastic door makes catching and releasing easy while avoiding pinched fingers, and a carrying handle makes it portable. 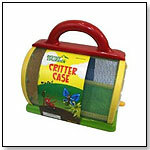 — With warmer weather approaching, these backyard exploration critter cases were on the top-10 best-seller list at My Club Tabby in Lake Charles, La., in spring of 2010. Owner Natalie Comeaux reported in March that the kits had been selling well for more than a month. — June Hargrove, co-owner of Black Forest Books & Toys in Charlotte, N.C., told TDmonthly that they sell 24-30 of Toysmith's Critter collection each month. This root growing kit can be fun for the whole family. It allows growers to observe the process from planting to harvest. The kit includes a wooden stand, three plastic root toobers, a growing medium, and enough seeds for several plantings of radishes, carrots and green onions. Instructions are also included. — These garden root viewers were listed as a top-10 best seller at My Club Tabby in Lake Charles, La., by owner Natalie Comeaux in spring 2010. They had been selling well for over a month in March. 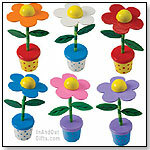 These wooden party favors are 4.5” tall and come in a set of four in various colors. Kids can push on the base and watch the flower move. — These little puppets were on the top-10 best-seller list at My Club Tabby in Lake Charles, La., in spring 2010, as reported by Owner Natalie Comeaux. These 2” ceramic planters are filled with rye grass seeds and a growing medium. Kids can pose them on a stand, water them, and watch them grow. Their grass hair can then be trimmed into various styles. Choices include a duck, pig and frog. — These little planter sets were popular in spring 2010 at My Club Tabby in Lake Charles, La., according to Owner Natalie Comeaux. Customers were looking forward to the arrival of spring, and the items had been selling well for over a month in March.